Many pet rabbits suffer from being overweight or obese, just like other companion animal species. Obesity in rabbits causes many different health and behavioral problems that can decrease the quality of life and shorten the lifespan of the rabbit. There are many signs of rabbit obesity, ranging from very subtle to extremely obvious. It is important to observe and evaluate your rabbit daily. This routine not only helps to identify hazardous health conditions but also allows you to bond with your rabbit. Obese rabbits are estimated to be between 20 and 40% above their ideal body weight. Assessing whether or not your rabbit is obese will involve not just his weight but also his body condition. Body condition is assessed by feeling as well as looking; you should be able to feel the rabbit’s ribs under a thin layer of fat. •	Pododermatitis: A common infection of the hocks of a rabbit; also known as sore hocks. The best means of preventing obesity is to feed your rabbit a balanced diet. To do this, make sure that you limit the amount of food and treats that are available to your rabbit. 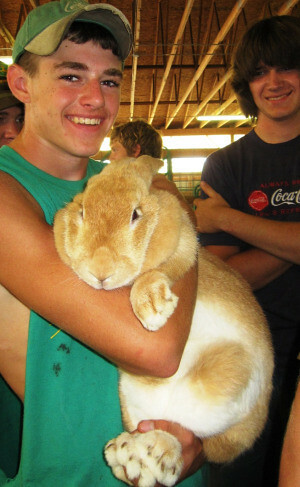 Rabbits older than 6 months should be fed a grass hay-based, pelleted diet and allowed free access to grass hay. Alfalfa hay and alfalfa-based pellets should only be provided to young growing rabbits and pregnant animals. Another factor to increase your rabbit’s chance of avoiding obesity is to provide him with adequate opportunities for exercise. With proper supervision, letting a rabbit stretch his legs in an enclosed, predator-free area will allow him to work off extra calories and energy. Exercising your rabbit is also a great way to spend quality time with your companion. Many companion rabbits are easily trained to be taken out on a harness and leash to provide additional supervised exercise. Rabbits can also be supplied with commercially sold rabbit toys or other forms of enrichment to increase physical and mental stimulation while in their hutches. If your rabbit is obese, following a proper and healthy weight-loss program is essential to the overall health of your pet rabbit. Your veterinarian can help you to set up a weight-loss and nutrition program for your rabbit.